Our perception of the urban environment is never simply a question of processing spatial data or having an A-Z knowledge of the area, but of our awareness of the human condition and our innate propenstity to make judgements upon it. It would be no different if we were to memorise the ordinance survey, wax lyrical from a glider high on the therms above the town or tramp from pub to corner shop daily in an attempt to come to terms with this little arc of earth. Some form of mental mapping takes place, a filtering and coding of the information not subject to the topography, but to impressions, assumptions, incomplete prior knowledge. In our search for a bigger picture, there will always be more than enough leads to follow, yet it is impossible for the human brain to comprehend total reality; we select what we can manage at any one time, personal landmarks which we assume will remain constant. Thus, when change takes place, it is far more acutely observed at a distance. In ‘mono 68’ we have what might pass at first hand for an enquiry of sorts, perhaps a personal reaction rather than a dispassionate documenting of the times. Yet the camera is particular. Its range is assured, its timing perfect. In these intimate images, in the telling of the story now, there is every reason to imagine great souls inhabiting small houses, no matter how many centuries have passed - with the spirit of the town carried in the faces and fabric as the year came to an end. Several decades have passed since this work was made and with them a certain kind of Dundee which some of us would like to think we know. It is the kind of faux familiarity which in the detail, mistakes Dundee for Glasgow or Edinburgh or any small industrial habitation of its time; key features which locate the area in a wider appreciation of progress in town and country planning. 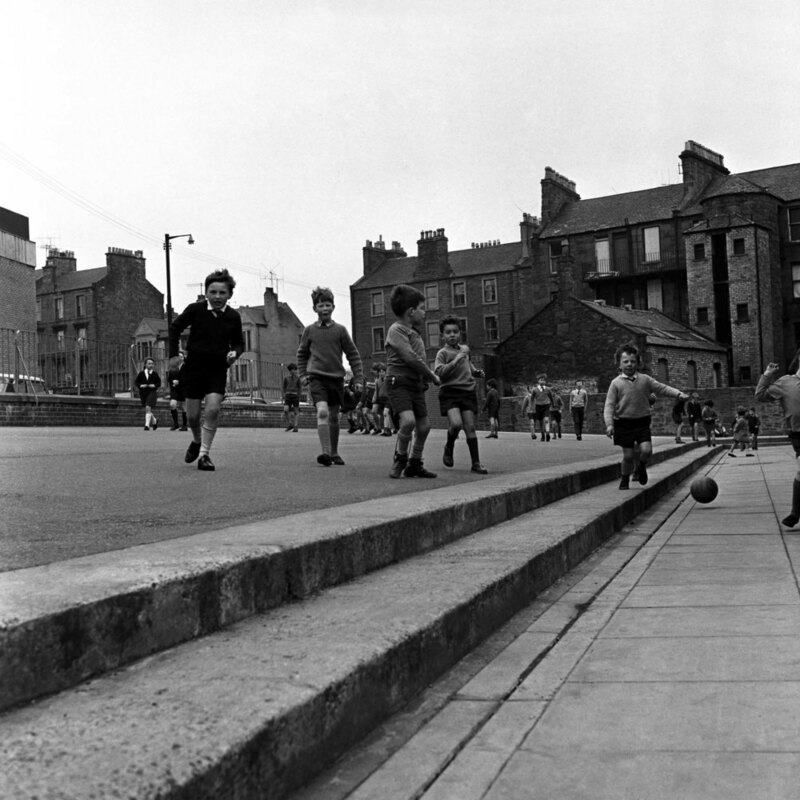 To its credit, it has been said that while some cities just grow older, Dundee has always aspired to grow younger. This places these images in a key position within its history. This evaluation is for us to make here and now, yet it is neatly framed by Jean Baudrillard’s paradox of ‘the magical eccentricity of the perpetual photographic detail’ and ‘the world’s refusal to yield up its meaning in photographs’ – which suggest that we add in a significant amount of our own meaning. The appeal of these photographs may be in our ownership of the moment, our attempt to inhabit the space, what we know about the past, our immersion in the event, the time and the action alluded to in the image. We are bound to make assumptions and construct a narrative which suits our own purposes, touching, even tangentially, on our susceptibility to nostalgia, rather than any forensic understanding of history. It seems impossible to separate ourselves, then, from the temptation to think ‘thank God it wasn’t me’ or ‘life was far better then’ as the process of looking becomes registering and the art of seeing becomes understanding. Most of the time we are not conscious that it is happening as we browse and take in the information. Is it possible, then, that the ‘contemporary’ photograph communicates ina different way? Empathy with the content is more likely if it is current or if we ourselves are the action, the person photographed, the subject, providing the information; that is, living our life right now and making sense of it as it happens. Connecting with the ‘oldness’ is complicated by the fact that there is less information which can be experienced and corroborated. When reading photographs from another era, our current experience is already in place, persistently ‘in the way’ of new realities – a perceived realm of say, history, truth, romance. The inference is that with a contemporary photograph, we have more to go on – and with an old photograph, more to get in the way. In the viewing, in the interpretation, we live our lives vicariously and have difficulty in making sense of what has happened. The likelihood is that we make a lot of it up. We should be comfortable with the invention. Either it has something to do with a suspension of disbelief or an insistence on facts (whatever they turn out to be) – though neither seem particularly satisfactory. When faced with a collection of images from a bye-gone era, we may prefer to regard them as not simply of their time, but about their time – less new, yetno less the ens reale of our journey of the imagination. For imagining is our only recourse to context. That suspended moment is an incomplete picture, as mysterious and elusive as the title of a photograph which contradicts what we see in it; the slow shutter speed which ‘loses’ a bustling High Street of crowds of people, trams and transactions in 1908 and leaves us looking at empty cobblestones and two standing figures by a horse and cart. The caption ‘Busy High Street’ is neutral, descriptive, innocent. The street was heaving. Life was being lived. Yet the technology, the science, the desire, renders the scene less than what it was. And therein lies the fiction. To achieve these results meant twin-lens reflex, film, wet process, darkroom, enlarger and a careful, deliberate form of communication, for – even within a year of walking on the moon - the mechanics of the camera had yet to surrender tothe binary code. It would have made no difference. With any form of photography, there are still smells, textures, tastes, sounds to trace in the viewing. We have the opportunity to engage all our senses. Mono 68 is an evocation of a living, breath- ing time and place and the histories which go with it - Alexander Wedderburne’s ‘great souls who inhabit small houses’. Those are the unfinished lives whose story we continue to piece together – as, in time, no doubt others will do with ours.